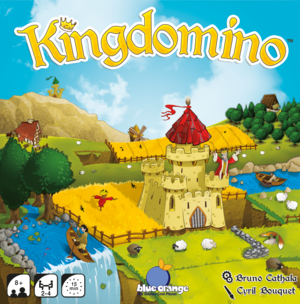 Designed by the legendary Bruno Cathala, Kingdomino‘s title is a clever combination of the words Kingdom and Domino. It’s actually also a pretty good description of the game. You build a kingdom using dominos. There is a bit more to it than that of course. Let’s have a look at it shall we? In Kingdomino you compete against the other players to have the best kingdom, measured in points. In each of the game’s 12 turns you will acquire a new domino piece to expand your kingdom. After these 12 turns you should (ideally) end up with a nice looking square kingdom in a nice 5 x 5 square grid. Kingdomino is played over 12 very quick turns where you get a new domino each turn. A domino piece consists of 2 square landscapes (there are 6 different types of landscapes in the game) and once you get a domino you have to place it so that at least one of the square landscapes on it matches up to an already placed landscape. You start of with a single square castle that can match up to any landscape type. So at the beginning of the game you’ll have no problems placing any of the dominoes. The only other rule for placement of the dominoes is that your kingdom can never exceed the 5 x 5 square landscape rule. Placing these dominos will give you different connected landscapes. What you want to do is get as many connected landscapes as possible, because that will give you more points. Speaking of points let’s have a look at how you get them after the final turn. Some of the pieces will have little crowns on them. For each crown you have in a connected landscape group you get a point for each of that landscape type. If you have 5 connected water landscapes in your kingdom, with a total of 2 crowns, you would score 10 points. How do you get these 12 domino pieces you might ask. This is actually done in a very clever way and it adds an extra layer to the game. Kingdomino has a total of 48 domino pieces, each with a unique number from 1 – 48 on the back. The higher the number the better the domino piece is. Each turn a number of tiles equal to the number of players are sorted from low to high. The order the players gets to pick them in depends on the domino you took last turn. If you picked the most powerful domino (with the highest number on the back) you will get to pick last this turn. But you never know what the next turn will bring, all you know is that you have to get the right dominos to build the best kingdom. Kingdomino might be a very quick and simple game, but it has enough depth and strategy to keep me interested and involved. I actually really like it, and I think it’s a ton of fun. Every time I’ve played it I have always wanted to play it again, and since the game only takes around 15 minutes to play, it’s easy to squeeze in a couple of these games in a row. But despite the quick play time it also has a layer of tactics. The fact that you can clearly see what dominos will benefit your opponents also adds a layer of tactical choice. And the very interesting way you chose the dominos really adds a lot to the game. Taking a good domino one turn means you will most likely get a bad one the next turn, and vice versa. I did have my concerns about it being too simple of a game, but it really isn’t. It’s just a very well designed game with clean and elegant rules. 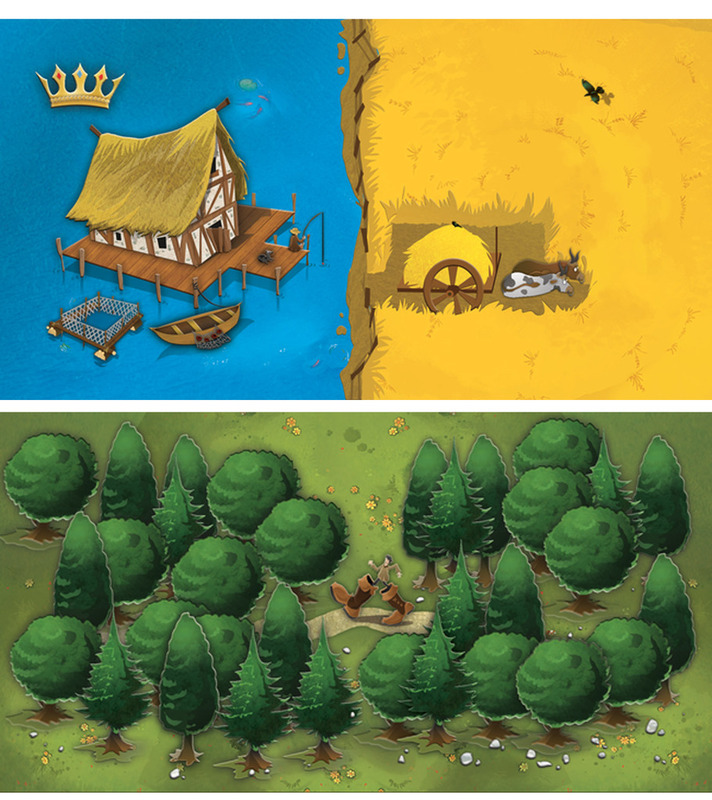 Kingdomino is a very simple game, with very simple and easy to understand rules. It’s a great game to teach new players and the rules can be taught in a matter of minutes. While the game does have strategy and depth these quickly become apparent. This game looks neat and i liked the tile selection mechanism, but it also feels lacking a bit of more umph/meat. Of course, i haven’t played it. And it looks a bit bland. Wonder if expansions are planned to add more depth to it. I feared it would be bland too. And while it is now a deep strategic game in any way it actually surprised me with how deep it is. The different types of landscape have different distributions. Some of them there are many of, but few of them have crowns. While there are fewer of some of the other landscapes (like the mines), but with more frequent crowns. So once you know the game (and if you play with all the tiles) you can try to plan a little bit ahead.